Silsila Kunal Mauli Past recurs. Veer tells Mishti that he wants to spend time with her and talk about their marriage. He asks her to give the duties of marriage arrangements to Ruhaan and Pari. Mishti agrees to Veer’s request. She tells him that she has no problem with Ruhaan. Radhika thanks Ruhaan for solving Veer and Mishti’s fight. She tells him that he has been a savior for them. Ruhaan is disturbed that he got the responsibility of Mishti’s marriage arrangements. Veer hugs Mishti and apologizes to her. Mishti feels upset and reacts strange. Veer wants to know if there is still any problem in their relation. Mishti tells him that she is still the same. Veer finds her behavior turning strange. Mishti asks Ansh not to hide his mistakes and be open with the family. She asks him to remember his life goals and not wander around with friends, who are a bad influence for him. Ruhaan is happy seeing the change in Mishti. She handles the matter maturely and gives freedom to Ansh. Mishti makes Ansh realize his mistake. Ansh promises to never repeat his mistake again. Ansh gets on the right track. Ruhaan meets Veer, who gets praising Mishti all the time. Veer is sure that Mishti is perfect for him. He wants to know about Ruhaan’s lover. Ruhaan tells him that he lost his love. Veer wants to find out about the girl, who has rejected Ruhaan. He asks Ruhaan to share his heart out. Ruhaan feels bad to cheat Veer, by loving Mishti. Pari informs Mishti that Veer has come home with his parents. Mishti stays busy in cleaning the house. She asks Pari to hurry up and finish the work. Mishti runs to get ready. Ruhaan asks them to open the door and attend the guests. Ruhaan welcomes Veer. Veer wants to know where is everyone. Veer makes fun of Ruhaan for attending them instead Mishti. Mishti turns impressing Veer and his parents again. She suddenly starts feeling discomfort with Veer’s touch. She doesn’t reason out her feelings. Ruhaan feels Mishti isn’t being herself, while she is with Veer. He doesn’t know why is Mishti being so pretentious. Veer and Mishti’s marriage cards turn up as a surprise, but leaves Mishti upset. 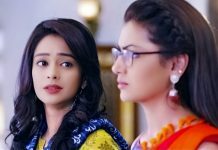 Mishti gets confused over her marriage, commitment and inclinations, while relating herself to her parents Kunal and Mauli’s complicated situation. She doesn’t want to commit any mistake like Kunal, that breaks the family. She gets inflicted because of Kunal and Mauli’s not so wonderful past.